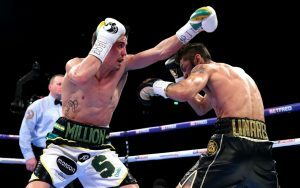 Underdog Anthony Crolla has vowed to “shock the world” on Friday night when he fights Vasyl Lomachenko, the three-weight world champion and double Olympic gold medallist. Bob Arum, the veteran promoter, said on Thursday that watching Lomachenko in the ring was equivalent to “watching Picasso at work on a painting”. That is some compliment from a legend who has worked with Muhammad Ali, Manny Pacquiao and Marvin Hagler. Crolla, the former world champion who challenges for both the World Boxing Organisation and World Boxing Association lightweight belts held by Lomachenko, has committed his all to preparation, both physical and mental. “I’m going to shock the world,” he said. “Victory would be the pinnacle of my career and then some. I think we’ll see a bit of everything in the fight. 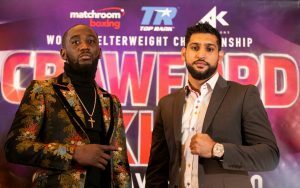 Should the Mancunian triumph, it “would be up there with the great performances by Brits abroad”, according to Amir Khan – who fights Terence Crawford, another rising Arum-promoted star, in New York next week as an underdog – but the Bolton welterweight believes Crolla should target the smaller man’s body. “It’s important Crolla gets to the body to slow him down,” Khan said. “Lomachenko is very smart. He’s going to have to be very smart in there. Anthony’s got a good body shot and his last couple of wins have come from body shots. Let’s hope he can do that. Weird things can happen in boxing but Arum’s promotional rival Don King’s infamous words resonate over this contest. Crolla has two chances in this fight: slim and none. And slim just left town. I see Lomachenko forcing a stoppage about the sixth or seventh round, from a barrage of shots, ending with attacks to the body of the Briton.